Irvine, Ca. Suzanne Broughton, mother of two, survived a day alone in her Irvine home without her family. "I'm not going to lie, I was pretty confused and scared at first when I realized there wasn't anyone in the house," said Broughton in a phone interview. "I kept hearing this weird noise that was freaking me out, but then I realized, it was just silence." "A mom who suddenly finds herself home alone can get disoriented easily," said Dr. Warren Turkle, an Orange County doctor who specializes in modern parenting issues like Chuckephobia (fear of going to Chuck-e-Cheese) and OCTEID (the need for a mom to compulsively talk in lengthy detail about their child's reoccurring ear infections). "It's best if a mom can wean herself slowly from the raucous atmosphere she is used to by replicating the noise with Sponge Bob on in the background or giving the cat the dog's bone in order to emulate sibling bickering." These are just a few tips in his book, "The Pottery Barn Kids Catalog Mystique: Parenting is about more than heirloom quality quilts and color coordinated storage baskets. "Moms simply need to affirm themselves by saying things like 'I used to be an attorney, I'm certainly capable of spending the afternoon by myself.'" In a press conference yesterday, Suzanne's husband, Larry Broughton, who was initially regarded as a sort of "local hero" by Suzanne's friends after offering to take the kids for the day, was on the defensive as accusations of insensitivity started to circulate,"Listen, Suzanne was mostly able to function before she had kids and I had every confidence she would be just fine by herself for one day," Mr. Broughton said to a smattering of reporters. "I even thought she might be able to get some stuff done around the house while I was gone." At that, an audible gasp was heard from the female journalists in the crowd. Though local officials didn't return our calls for a comment on the legality of leaving a mom home alone for an entire day, there was a statement from the guard at the Broughtons' community gate. "I don't know. I don't think I like it," said Kerby Williams as he wrote down the license plate of an AT&T truck. "What next? Walking alone through the community or worse, OUT of the community? I just don't like it," shaking his head as he turned away an unauthorized bus full of school children. When asked how she filled the time when she was alone, Mrs. Broughton admitted she had lots of plans--like sorting the orphan sock basket, getting the family's taxes together, organizing her photos on iPhoto--but, she said with a spark of energy, she ended up taking a nap, looking-up old friends on Facebook, and then watching 10 shows that had accumulated the last two years on her DVR. "It was one of the best days of my life," she said, obviously emotional when thinking back on the day. Written for my blog at the ever-awesome: OC Family. 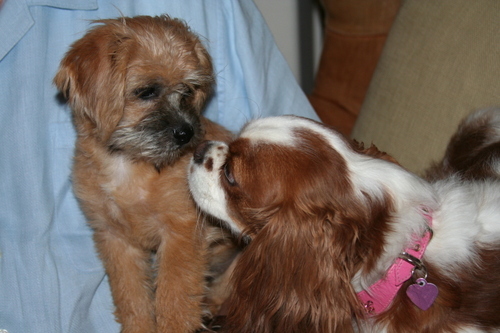 This is when Hazel and George first meet. She still isn't sure about him. No reaction from Peter Rabbit. I had to do it. They pushed me to it. I was drowning in social networking sites, instant messaging, handheld devices and emails. I couldn't keep all my internet worlds updated on every move I made--especially when the very existence of them was making my life less...like life. Everyone from every site I was member of, every internet tool and widget was invited to come to the Huntington Beach Hyatt on Monday for a brief speech by me, cocktails--which proved a mistake--and then breakout groups. When I arrived at the meeting there was already a ruckus at the front door. Great... "What's going on?" I asked the guard I had cleverly hired, predicting trouble. "This guy says he was invited, but he isn't on your 'friends' list." Well, well, there stood "SirDan," who had been trying to be my "friend" on MySpace for months. Now there he was in person, nothing like his shirtless picture, but surprisingly, actually 99 years old! "Listen 'SirDan,' I have told you a gazillion times already, I don't make anyone a 'friend' who I don't know--nothing personal." He sulked away, slowly...I can only assume because of being rejected in person...and his advanced age, of course. I headed straight for my podium when up bounced AIM, "Hi! What ya' doin'?" Grabbing her arm, I whispered through a forced smile, "I told you, be a good girl and please don't interrupt me every five minutes tonight. I really have to get this done." " ;) " She said and sat down quickly. Perfect, now I was running late. I knew I had to avoid the "Twitter" table at all costs...."OMG! Who ARE all these droll, tedious people?" one mused. "A lot of these are my friends...you know, people I have actually met in real life," I futilely attempted to explain. They all just looked at me blankly for a moment, as if not processing what I was saying, then went back to chatting passionately about the obvious awesomeness of "Grease 2." Oh, this is going to be harder than I thought. I needed a drink--pronto. I headed out of the room and into the bar. I pulled out my iPhone to call my husband, who was sitting at the Linkedin table, to make some excuse for me. "Hi hon, can you...what?...I'm sure I sent them to him..." Apparently, our accountant, sitting with my husband, just couldn't adhere to the "no work-talk" rule I put in place for that table. "I'm going to the bar, please stall for me." As I approached the bar, I noticed one solitary figure standing there. Squinting, I couldn't quite make out who it was... "Don't even think about pretending you know who I am," he burned. Then it came to me--It was the Palm Pilot I received for my birthday 10 years ago. I slowly slipped my iPhone into my handbag and greeted him with a smile. Unmoved by my friendliness, he said, "I know you had to look up "retro handheld devices" last week trying to remember what I was called," he said, poking me in the chest with his stylus. "You and your friends had a good laugh," he growled bitterly. Then turned his square back to me and ordered another drink from the bar. This was my chance, I was dying to ask him for my friend's phone number I had entered nowhere else but in my Palm Pilot..."Do you by any chance still have the number of..." He slowly turned back to me and gave me the most sinister blue/green stare. "I just really want to get ahold of her," I weakly finished. Defeated, he threw his perfectly calculated tip at the bartender and staggered out to a car that sped away down PCH--my old pager at the wheel--listening to the mixed tape my college boyfriend made for me. At that moment, my phone rang and I dug deep to find it. "You have GOT to get back in here! All of your old college friends on Facebook started to tease your high school friends from Classmates about how the 80's was a 'vast vortex of mediocrity' and the bands from your MySpace page took the spat as their cue to trash the place. Hurry!" shouted my frantic husband. I ran in just in time to see Morrissey throw his goat cheese salad at David Sedaris, both seated at the MySpace table, apparently because of David's remark about pompadours being a "clear grasp at fleeting youth." Naturally, the Flickr table took full advantage of the photo op and the bloggers, who had their cameras out taking pictures of their dinner, snapped a few good shots, as well. This was obviously a bad idea. Bringing together these different worlds, which had been safely separated by passwords and usernames, was clearly not meant to be. I suppose I should just go back to relating to everyone (and thing) the old fashioned way--via my Mac. This is Captain Gene Larioux (pronounced Larry-hoo). He is married to my friend, Jill and we all traveled together on the Disney Cruise. It does get kind of awkward when we are all together since Gene and I dated years ago and there is still that lingering weirdness. Larry and Jill don't like it when we bring up our past, but I can't help it! Every time I hear our song, "Brandy," I just stare at him nostalgically, remembering all those fireside lunches at The Velvet Turtle. Memories like dancing in a dimly lit steakhouse on a sweltering afternoon are hard to forget (and easily triggered by the smell of Old Spice, Juicy Fruit and stale pipe tobacco). Back then, Gene and I would have long talks about his dreams of becoming a television writer, with sitcom pitches like "Always The Best Friend, Never The Bride" about poor doggie spinsters--I can't believe that one never went anywhere. His brand new idea "Fashion Emergency For Infants" where Justine Bateman and Andrew Ridgeley (the other guy from Wham!) raid the closets of fashion challenged babes, saying things like, "Onesies? They should be called Millionsies, you have so many" or "Nice bib, where's your binkie, baby? 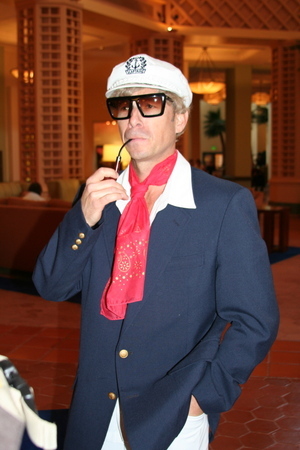 Oh, here it is..." is bound to rouse interest at his next industry mixer. 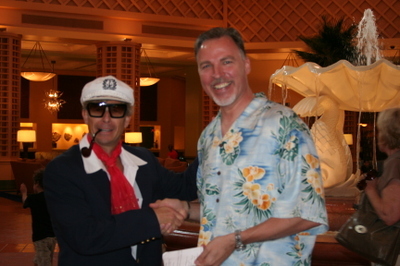 Here he is giving Larry an award for being "Among the Tallest" on the cruise which is a very prestigious award. It is accompanied by a complimentary "Connie Francis"--Gene's signature drink. Larry loved that drink. It's made with Malibu Rum and Fresca, among other things, and is served in a hollowed-out Kiwi. It's a small drink, and messy because the kiwi skin gets very soggy. It's more like a shot really. A "Connie Francis" is served on a peeled-off label from a bottle of peppermint schnapps. Which I think is suppose to resemble a beach blanket, but just ends up sticking to the table, adding to the untidiness of the beverage. Anyway...I really got off track here. I just wanted to share some pictures from our trip. Irvine, Ca. An Irvine mom was overheard in Conner Bakery today saying she couldn't afford to buy a new car at the moment. Several diners were so riddled with shock they found it difficult to finish their panini sandwiches. The woman has been identified as Suzanne Broughton. When we spoke to her, she said she didn't mean to disorient anyone. It was just that she and her husband had decided to wait to buy a new car because they couldn't manage it right now. Broughton assured concerned community members at an impromptu press conference she was going to make a purchase in the near future because, "My car is nearly 8 years old and doesn’t have a GPS system or a DVD player." At this admission, in an obvious attempt to keep her from incriminating herself further, her companions swiftly whisked Broughton away in a freshly detailed 2008 Tahoe. Her husband didn't return our phone calls, but in an open letter to the citizens of Irvine he wrote, "I am deeply sorry for the unpleasantness this has caused my fellow consumers. We meant in no way to offend. My wife has a very loud speaking voice after her second Diet Coke and didn't know the music was going to lull at that very moment." Speaking outside the Broughton's home their UPS man spoke about their recent spending habits, he said, "Well, I have been delivering less J.Crew and Amazon packages lately. But, I had no idea it was this bad-- to acutally ADMIT it!" In a phone interview yesterday Broughton was asked if she was taking any further steps by trimming down on small expenses like pedicures and vanilla lattes from Coffee Bean, she responded, "Let's not get crazy." 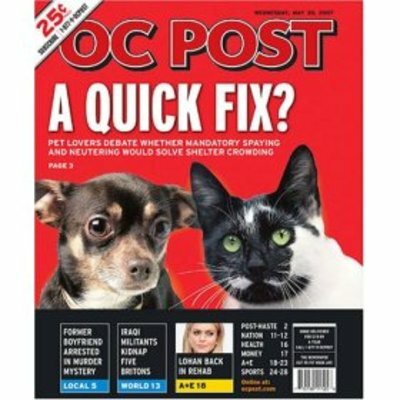 The big news here in Orange County is the OC Post married The Irvine World News last week in a private ceremony. I am overjoyed that the Post has finally found someone who appreciates his slight stature and brevity. The Post and I dated briefly in the beginning of 2007, but it didn't work out for us, see painful breakup letter here. So, you can imagine my surprise when I received an invitation to the after-wedding reception. The Orange County Register called me and asked if we could go together, as both of us aren’t seeing anyone right now and hated the thought of going alone. I agreed, with the promise from The Register he wouldn't talk about the housing market the whole time. “The words 'credit crunch' won’t leave my lips the entire night,” he said with irrefutable assurance. When we arrived, we found SqueezeOC standing just outside the door crying softly into her hands. I approached her and asked what was wrong. "My boyfriend is such a nincompoop (but she didn't use the word nincompoop). He was supposed to be here an hour ago, but he just sent me a text saying his band's van broke down and he won't be able to come." Trying to comfort her I said, "I’m so sorry, maybe you can come in and sit with us." When hearing my generous offer, she just scowled at me and started feverishly texting someone more empathetic to her tragedy. This is the hardest letter I have ever had to write. I am just going to come right out and say it, "It's over." I know this can't come as a shock to you. We haven't spent any time together lately. It's not you, it's me. You're great! Your formatting and writing are really special. I think you will make another Orange Countian very happy. I guess I am just a really shallow person. I want to make as little effort as possible to get my news and even then, I am only mildly interested. You have probably figured out by now, I have been getting my news behind your back. I just couldn't help myself. The OC Register online is so accessible to me and KFWB is so tempting with its promise "All the news, ALL THE TIME" and it gives me the "World in Twenty Minutes." THE WORLD! How could I resist? We will always have that charter year together. When I'd hear the mini-truck with no exhaust pipe slow at 5 am as its driver threw you as far from my doorstep as possible, my heart would leap with excitement. You remember, sitting around in the morning, my finger following along your pages as I drank my coffee. It really was everything a newsreader could ask for in a journalistic relationship. Please don't let this stop you from becoming the paper you want to be. Keep telling yourself, "I AM 'Cut To Fit Your Life'... I AM" Just not my life-- not right now. P.S. Maybe you and my subscription to National Geographic can get a place together.